Well it’s just over a year since my last post and I have decided to return to blogging again because there is so much going on that I think needs mentioning. Over the next few weeks I will be writing on the town, the seafront, the pier, yet again, some highway ‘improvements’ and much else. T he Longest Pleasure Pier in the world, with a train service too. Probably one of the most iconic conference, meeting or wedding locations in the country The Royal Pavilion on Southend Pier. 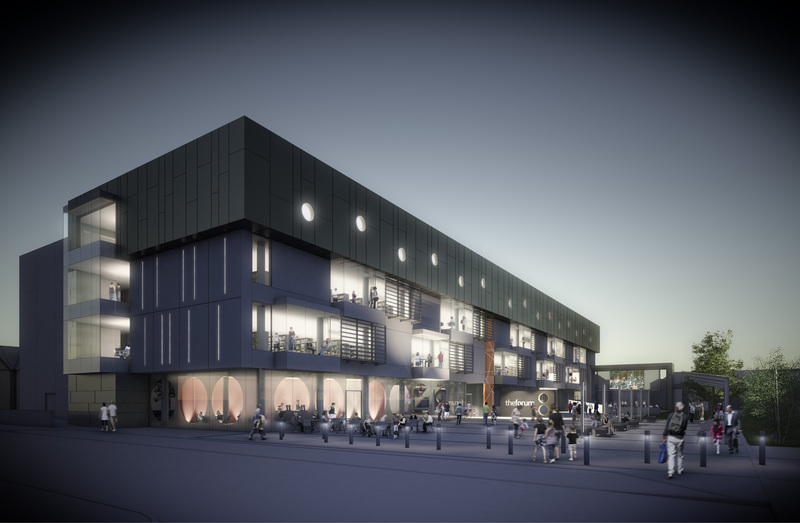 The Forum on Elmer Square– Southend’s newest lo cation and joint library venture with accademia. Upto 200 delegates in a state of the art facility or smaller rooms available and just two minutes from the station in the heart of the town. The Cliffs Pavilion, our largest venue, upto 1600 delegates perched atop the cliffs with glorious estuary views and outside space to take in the sea air! Excellent Hotels, many with estuary views and great conference, meeting and wedding facilities. why not try the Roslin Beach Hotel, The Park Inn Palace or the Westcliff for exceptional sea views and facilities. A tad further afield, all of 3 miles from the seafront, and only a 5 minute walk from the station is the Holiday Inn at Southend Airport with very interesting views and great facilities. Southend has numerous small guest houses, nearly all have 3-4 stars and great sea views. Southend is served by two train lines, C2C fom Fenchurch Street for 7 stations in the south and centre of the town and Gt Eastern from Liverpool Street for London Southend Airport and Southend Victoria. Trains run approx every 10 minutes peak and every 20 minutes the rest of the time- thats time two of course! I should mention our great climate, over 7 miles of beaches, the wonderful fishing village of Leigh Old Town, the boutique and niche shopping area of Leigh on Sea, marine activities including kite surfing and many many interesting restuarants, the list just goes on…. So why one has to wonder does Southend Council think ‘Cultural Centre’ is a good one? Let’s face it how many children or teenagers or even any visitor is going to get excited about visiting a ‘cultural centre’? indeed even our die hard locals are sceptical! Would you hold your wedding or celebrate an important birthday in a ‘cultural centre’? Well I suppose a few might but surely ‘Pier Pavilion’ is better, especially if Southend is allowed to add Royal or Jubilee to it- The Royal Pier Pavilion or The Jubilee Pier Pavilion are both a little more exciting and in no way deter from the place being used for ‘cultural’ activities and there are a number of other possibilities along this theme – Southend Royal Pier Pavilion etc. It was put up in 2012 the Jubilee year after all and since we lost out as a city could we not please have a Royal Pier to reflect the Pier’s royal heritage or even a Royal to officially open it. 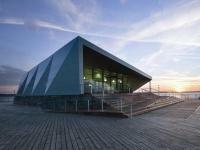 There are many uses that The Pier Pavilion could be used for- cultural events certainly, but also exhibitions, parties, weddings, fund raising events, mini conferences, artists at work days, lectures, school room etc and I firmly believe that labeling it as a ‘cultural centre’ will deter more than it will attract. So come on let’s get it changed before it’s too late, let’s put some sparkle into the end of our pier after all it is supposed to be fun! 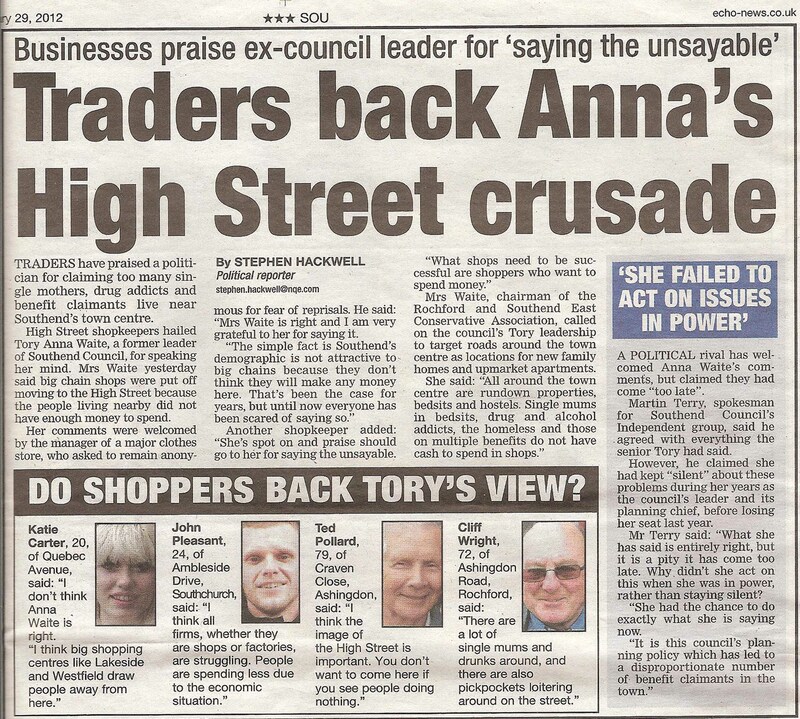 These are my views and are not the views of the Southend Conservative Group or Associations. Work on the new H&M Store in the old Woolworth’s building is well underway. 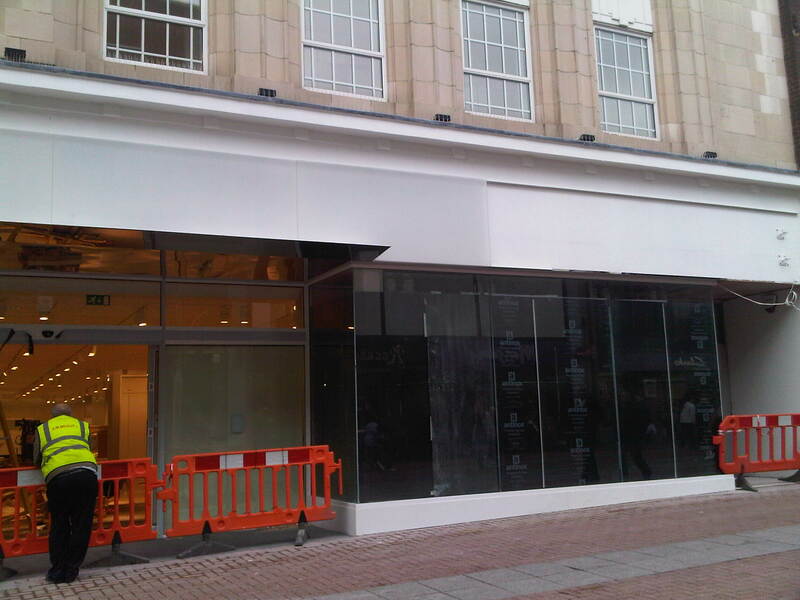 Now lets be clear this not just a quick revamp of the TJ Hughes store, it is a major revamp. I applaud the active shop front on Alexandra Street, so much better than the awful blacked out windows of the Discount Store on Clifftown Road- Why did the Council allow this when it is against their policies of active shop fronts? 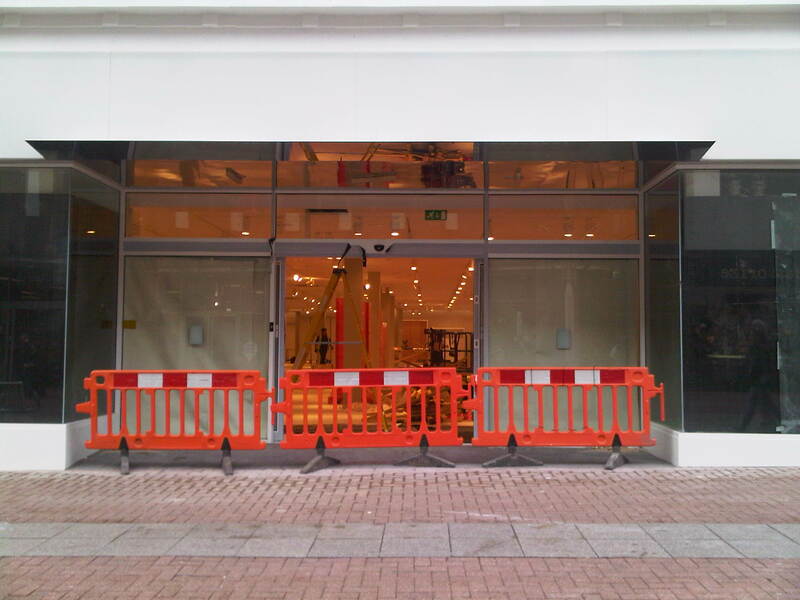 The new shop front and entrance on the High Street looks contemporary and smart. Now is the opportunity for the council to get behind the High Street and invest a little in maintainig it. It is about 10 years since the High Street was revamped and now it needs a little attention, perhaps some new seats and certainly the replacement of the cobbles. I am not talking consultants or mega bucks just the appliance of little common sense. Many towns would be give their hind teeth for such an investment in the current economic situation and Southend has weathered the High Street decline relatively well, so let’s get behind this show of faith in Southend let’s use it to get Southend into the national press, the estates and retail trade press and to attract further investment from retailers prepared to invest in decent stores in our High Street. 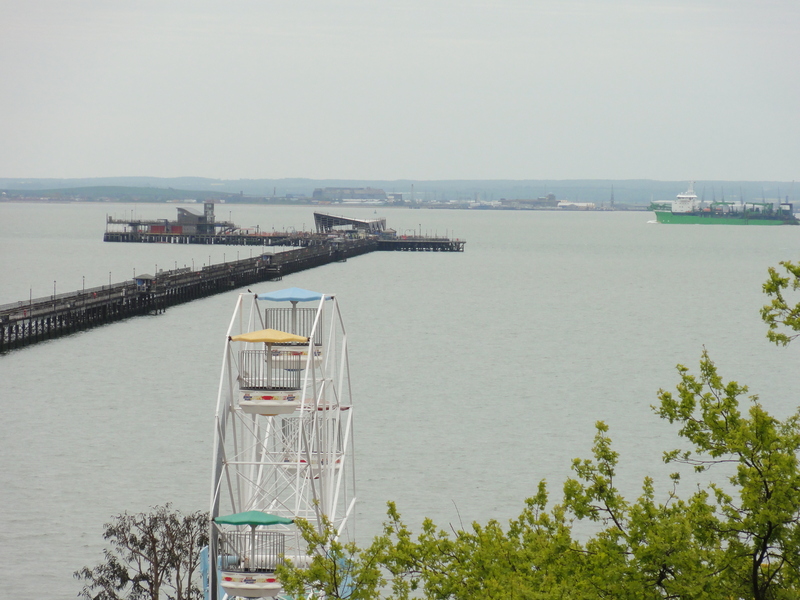 Southend Summer- It’s a great place to be….. So at last the sun is out and the children have broken up. The last few days have seen thousands flocking to our beaches and seafront. The new water fountains at City Beach have been a real hit with the children. Perhaps it was our win in the Tour de France but cycling on the seafront cycle track seems very popular too, for all ages. For those that want to get active there is the Southend Marine Activity Centre where all sorts of watersports can be experienced and there is the Essex Boot Camp which trains in both Leigh and Southend on the cliffs, evenings and weekends. 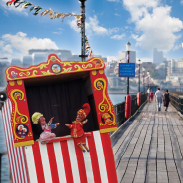 If it’s a bit of culture that you fancy then take a look at visit southend where you will find a whole list of events, many on the pier too, ove r the summer. Feeling hungry then download a copy of Dine on Sea and choose yourself a place to eat. The Pier Pavilion or Cultural Centre is at long last ready, so why not go down the pier and take a look and decide for self if you like it or not. For a picnic by the sea try East Beach in Shoebury it has picnic benches and BBQ facilities ready for you to use your grills on, wide green grass expanses and no cars, so take a ball or two and have some fun by the seaside- or you could just watch the kite surfers whilst sunning yourself. For something a little different why not go to Leigh, have yourself a morning coffee, browse the shops then wander down the old staircase beside the Church to Old Leigh, cross over the bridge and perhaps have a light lunch or just take the camera for some intersting shots of this working fishing port.. These are just a few of the many things on offer in Southend, so do a little digging and have a great day out in Southend, it’s a great place to be. It was really great to be able to watch the new pavilion being slowly winched up from the barge and then down on to the decking. In about 4-6 weeks it will be ready for business. The black weatherproofing will be hidden behind the softer cream of the exterior finish, the glazing will be in and it will be clear to all that the new pavilion will be a real assest to the town. Well, to nearly all, as there are always those that object and disagree for one reason or another. Now this brings me to the point of my post, Southend can be a great destination, it can attract jobs and tourists but it would be a great deal easier if some of the habitual objecters just stopped being so negative and gave the town, the council and those trying to get things moving a chance. How to they think it looks if someone is coming into town for a job interview to pick up the paper or to go online and read some of the truly negative and nasty comments- well not great and this impacts on not only job applicants but those wishing to open a business or invest in the town. 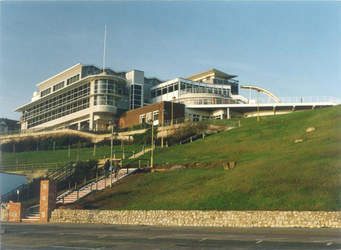 Whether you personally like or dislike the design of the building, the town has very firmly stated over several years and consultations that it wanted the Pier to be a maritime/cultural place not an extention of the arcades, a place for families, locals and visitors, young and old and that is what the council has set out to provide. So let’s get behind the town, stop the negativity and at a time of deep economic crisis and strife support this initiative which will hopefully attract more visitors to town and provide residents with a good quality venue- all this will add up to a beter economic climate for Southend, more jobs and more oportunities. 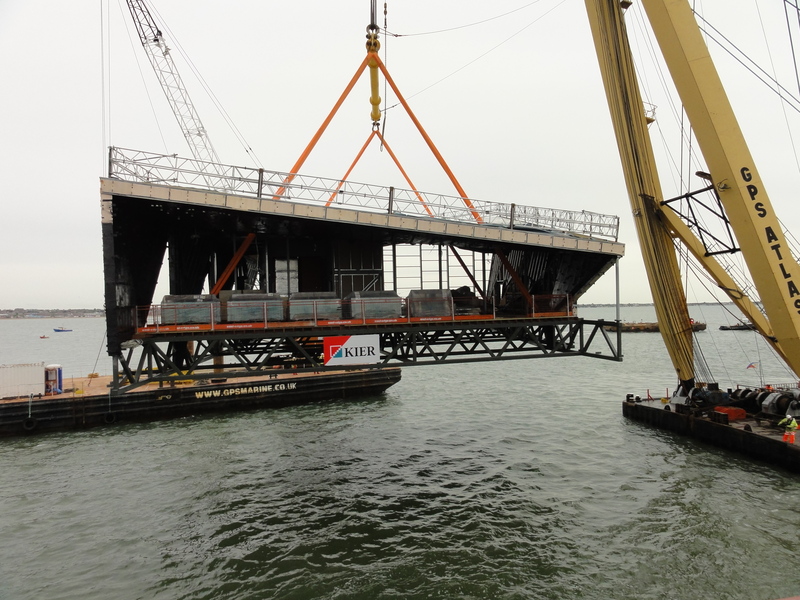 The Pier Pavilion is on its way! Tomorrow will be a landmark day for Southend. 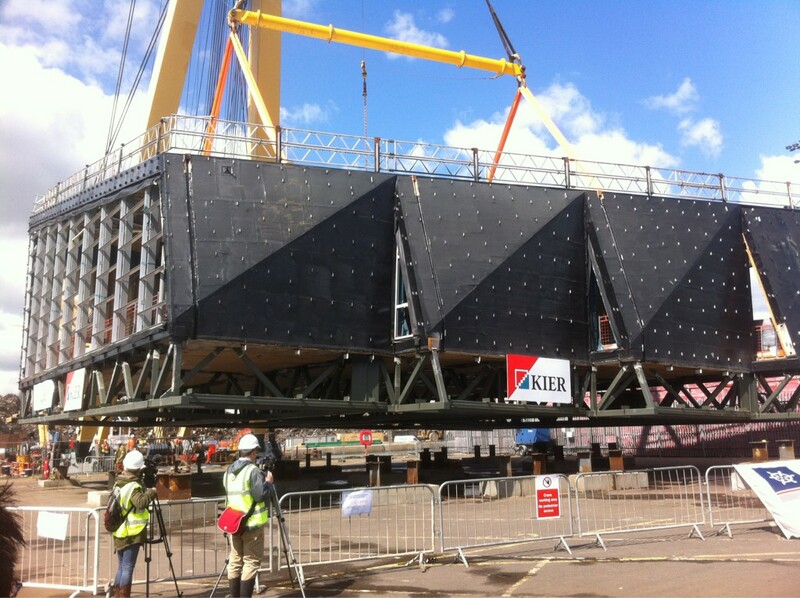 At long last the new building has been hoisted on to a barge that will slowly bring it from the docks in Tilbury where it has been assembled to the Pier. It should be lifted on the Pier some time tomorrow. 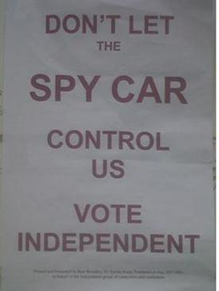 You couldn’t make this up…..
Over the past few days the Independent party have been getting up posters about the ‘spy car’ these postershave gone out in Ron Woodley’s name on behalf of the Independent Group. However, some Independent Cllrs have been calling for the CCTV car to be deployed in their wards! If they cannot even agree on the CCTV Car how can they think that they could form a co-alition or take control of the council…. I have very little desire to spend much time commenting further on Martin Terry’s increasingly surreal blogs. He responds to my previous post by claiming I failed to provide context. Well I posted not only Martin’s comments, but the entire article from the Echo so that there could be no question of misrepresenting the context. Independent leader damns himself with his dishonest and fake comments (with evidence). I suspected when I posted about Martin Terry on Saturday that he lacked the self awareness to stop incoherently ranting about me, ‘bilge pumps’ and whatever other phantom evils invest his mind. What Martin Terry didn’t realise is that to an extent I was counting on his response as a basis of bringing something rather interesting to light. Martin Terry has made great play of the offense he takes from my ‘supposed’ comments about single mothers. Never mind that he regularly misquotes or misunderstands what I said, he describes my comments as a disgusting attack, blighting single mothers, as spiteful, nasty, shameful and disgraceful. He also repeatedly calls for my resignation. So why would I repeat all these accusations? Well let us take a look at the Southend Echo newspaper of February 29th. This was the Echo’s second story on this topic. As part of this piece the Newspaper gives a comment to the opposition. A whole box set aside so we can read the views of the opposition councillors, and who did they pick to give this comment? Why none other than the fulminating Martin Terry, leader of the Independent party. 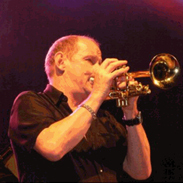 And what did Mr Martin Terry have to say about my comments? Why, he said that he totally agreed with them. Expanded and unedted section from article in Southend Echo from 29th February 2012 showing Martin Terry’s comments. See below for context. Not that I should resign, or that he was appalled or even that he agreed only in part. No, he stated that he TOTALLY AGREED with them. Let me quote him again where he says “what [Anna Waite] said was ENTIRELY RIGHT“. There is more than enough hyperbole in politics and I have no wish to add to it by making exaggerated comments or personally insulting the guy, especially when his rants say more about him than I could. But who, in all honesty, can respect Martin Terry, or have him as their party leader, when he carries on like this?